The ProForm 510 E Elliptical introduced to the market in 2013, is the health equipment that one would go for to counter calorie problems. It also provides body toning and works up the upper and lower body with each move you make. Other features include the upper-body resistance arms and EKG heart rate monitor. It also has smart features like the iFit Technology. The workouts are powered by Google Maps, automated resistance controls and professional training with Jillian Michaels. It contains weight loss features such as the adjustable stride ramp. The ramp has five positions which isolate specific muscles. It can adjust from 18”-20” for a comfortable fit. The 5” display keeps track of your workout advancement. The product’s current price on Amazon.com is $599.00 inclusive of shipping cost. The steep incline ramps target your calves, quads and glutes with the pre-determined five positions for distinct results. It also inclines up to 20 degrees, so that focus is placed on specific muscle groups. It is designed for homes with multiple users whereby they can adjust the stride length to meet their comfort needs. The 5” Inch Backlit Display is designed to display your time, pulse, distance, speed, resistance and calories burnt. The 510 E Elliptical has a Front Drive Design, which is a sophisticated footprint of the equipment which doesn’t take much space. It provides maximum stride length and an extra smooth ride for the user. The innovative design provides quick workout access because it’s easy to mount it, and also get off from it. The equipment also has upper-body arms with soft grips which accelerate your muscle tone, and burn more calories with these comfortable workout arms which engage your whole body and improved cardio benefits. The workout equipment also has 18-20 built-in workout apps. He helps you to tone and lose weight. They also automatically adjust the elliptical resistance to maximize the exercise time to achieve faster results. The dual-grip EKG heart rate monitor has in-built handlebar sensors which monitor your heart rate with every workout. You can also enjoy your workout favorite music with the iPod Compatible Music Port. You also need to remain hydrated throughout your workout process. The water bottle grip is designed to hold your water bottle during your workout session. The machine has movement wheels that assist in shifting the machine from one position to another. It also folds up vertically so that you can save up on your valuable floor space. According to customer reviews, some users found the product to be an excellent buy for their money. They appreciated the product because of its high-resistance levels, adjustable stride degrees, and the five-level presets. 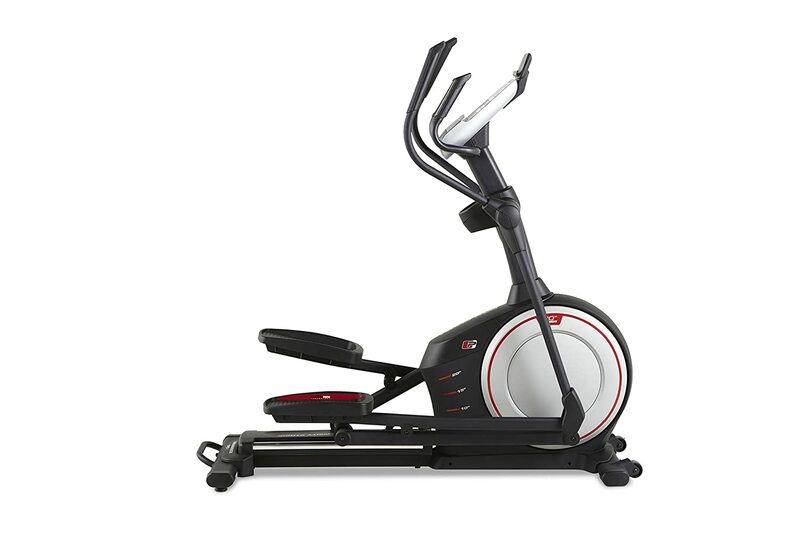 With regards to the ProForm 510 E Elliptical, the product is described as “very loud” during the workout process. It also requires continuous lubrication in order to operate efficiently. For some users, the low-stride length is a problem because they fail to find a comfortable position to work out. It feels like a stair stepper rather than an elliptical motion. It is especially rampant with tall users. The machine also has a limited warranty of up-to one year for the spare parts and the labor involved repairing the machine. The iFit membership is also costly which is charged at $9.99 per month. The machine also lacks in robustness as compared to other machines available in the market. Its features are also fewer with comparison to other versions of the elliptical. According to critical customer reviews received, some users complained that their Elliptical machines broke or snapped within weeks of purchase. It was the case even with users who are less the standard weight of the machine at 275lbs. Also, the manufacturers’ communication channels were weak, and it took client’s hours to reach them. With a price of $599.00 inclusive of shipping, the ProForm 510 E Elliptical package has plenty of features which will benefit the user. It is also difficult to find another fitness machine which offers 18-20 training applications, 18”-20” adjustable incline and resistance levels that simultaneously works with the iFit accessibility. It is worth the purchase, when you are interested in an elliptical machine, and your budget is tight. This is because of its 275lb weight capacity which is good an entry level machine. The assembling and installation process is also time-consuming. You should allocate enough time, on a day when you are not distracted with other matters to assemble it properly. The lubrication packets should also be frequently used to avoid noisy workouts. While the machine is excellent on paper, it lives a lot to be desired especially on the construction quality, stride quality, comfort, durability and usability. With a tight budget, though, you get to enjoy a good quality machine and the varieties it offers as a device.